If it’s November it must be time for the Philadelphia Marathon weekend. This was my first marathon back in 2011 and I’ve run it every year I have been at home ever since (missing only 2014). As has been my habit, I signed up for the race on April 1st the day registration opened. This year had a number of changes to the race weekend that were not announced until the end of April, almost a month after registration had opened. For the last 20 years the race was organized and run by the City of Philadelphia. This year, the job of putting on the race was given to the Philadelphia Parks and Recreation. This is the same organization that puts on the annual ‘Broad Street Run’ (which is the nation’s largest 10 mile run). Additionally they announced that the Half Marathon (traditionally run the same time as the marathon) would be moved to the Saturday, the day before the marathon on a completely new course. I felt bad for all those people who had already signed up and made hotel arrangements. Judging by the feedback the race received on Facebook, this wasn’t a popular change although at the time this did not impact me. One of the best parts about running the Philadelphia Marathon are the crowds. When the half and full races are run together (the half is the first part of the marathon course) everyone runs together and just splits at the 13 mile mark. Plenty of crowds are out on the first part of the course. It is quieter on the second half but that is expected based upon the numbers doing the full. With the change splitting the races I was concerned that the race would lose an element of the great crowd support for the marathon as there would be less spectators out on the course. Nevertheless I put it on my training plan as the Sunday race was all I was planning to run. However, in mid-September they announced that with the demand from runners who wanted to run both days they created a new ‘Challenge’ race, the ‘Rocky Challenge’ race. Well…you know me…if there’s an extra medal I have to sign up for it. I can still see my wife rolling her eyes at me knowing full well she wasn’t going to be able to change my mind, and so with her permission (well, kind of) I signed up for the inaugural ‘Rocky Challenge’. I now would be running both the Half on the new course and the Full on the original course (with just a couple of alterations). 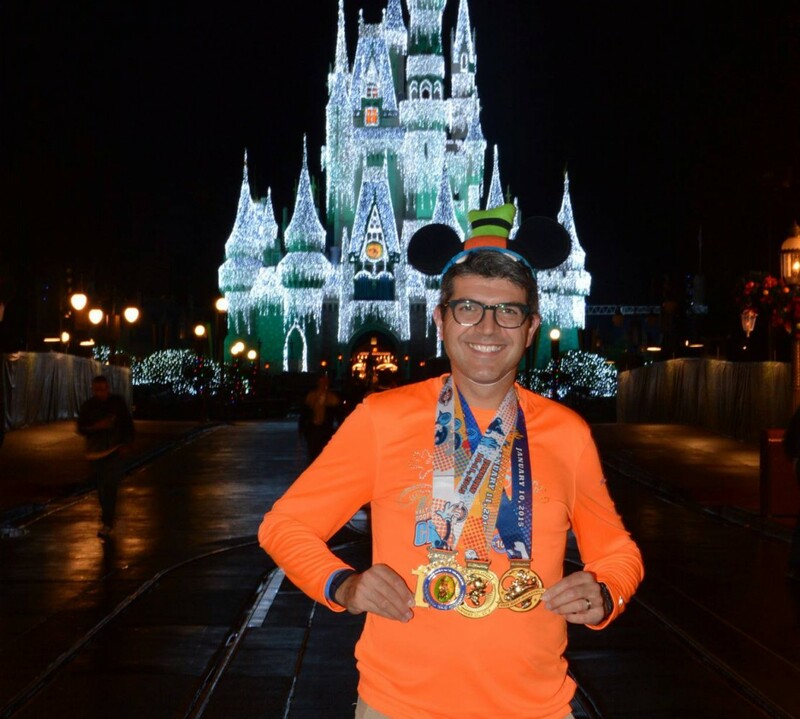 I have done challenge races before, the runDisney ‘Goofy Challenge’ in 2013 and 2015 and also the inaugural ‘Dopey Challenge’ in 2014, so I knew what I would be in for. I had just 6 weeks between the Mohawk Hudson River Marathon and the Philadelphia Marathon weekend so I adjusted my current plan (2 weeks recovery, 2 weeks training, 2 weeks taper) to make sure that my weekend runs were simulations for race weekend, i.e. my Saturday run would be at least half the distance of the Sunday run so I was doing the same distance ratio each weekend prior to the race. One other adjustment I made following the Mohawk Hudson River Marathon in early October was changing my plan from run/walk to try running these races straight through. While the run/walk method has been my mainstay since I started running, I wasn’t happy that despite doing a run/walk for the Mohawk Hudson River Marathon, I still got fatigued by mile 15 and slowed significantly by mile 19. My plan was to start running straight for my training runs to find the exact distance where I started to fatigue running straight through vs run/walk. To my surprise I wasn’t finding a great difference. With that being the case I decided to keep running straight through with the plan to try this under race conditions. Training seemed to go well. Race weekend arrived. There had not been too much communication from the race director nor on social media with regards to dates announcing bib numbers, waivers, corrals or even the event guide. There had been no reveal of the medal (despite announcing that they were waiting to reveal…it never happened). The expo was down at the Philadelphia Convention Center as per prior years. Before I headed down that day I left a message on the Facebook page asking if there was an opportunity to donate used running shoes to a charity. Again, no response from the race director or his team. I noticed plenty of people asking questions prior to the expo and there was no response. I wasn’t optimistic going into the weekend. Traffic on a Friday evening in Philadelphia is not good. It took me almost 2 hours for what is usually a 45 minute drive from home before I reached the Convention Center and parked and made my way to the expo hall for race packet pickup. As per prior years, the expo was set up in a similar manner. Once you entered there was a kids area to the left of the hall, bib and shirt pickup was at the back of the hall. Once you had your stuff you made your way through the official gear shop and then into the general expo. Now maybe I have been spoiled by so many years as a runDisney challenge participant and maybe I am being unduly harsh as this was the first year of the challenge here in Philadelphia, but the volunteers were not too aware of the challenge option. It wasn’t too easy to find but at the end of the hall there was a table with challenge bib pick up. I picked up my bib and noticed it didn’t have a corral assigned to it. I had noticed online that for all race numbers there were corrals assigned but not for Challenge participants and when I received my bib the corral was left blank. I had to go over to the corral change table and they looked up my corral based on my expected finish time, took a corresponding colored marker and wrote on my corral placement!! Having just looked at this picture again I am wondering why may name and age is accompanied by an ‘F’ and not an ‘M’??? I asked the volunteers if there was anything special I needed to do for the challenge, i.e. was there a special extra shirt or something I needed to pick up. They said no, I just got two gear bags(!) and a half marathon shirt and a full marathon shirt for which I had to get into two separate lines. So far there was nothing special to show this was a challenge. I hadn’t seen any medals, I hadn’t received a special shirt. Essentially I felt like I was just running two races with nothing additional to show for it. I left the bib pick up area with my two bags, two shirts and hand marked bib and headed through the official merchandise area. There was plenty of varieties of merchandise and this was also split into men, women, half and full gear but no ‘Rocky’ or other challenge related merchandise. Again, I’ve been spoiled by runDisney but seriously I was thinking this challenge was just a way to sell spaces in both days and there was nothing being done to celebrate it or provide anything special for the runners. I was getting more disappointed as I progressed through this expo. One good thing from the expo was that I saw my fellow Mickey Miler, Sam, who was there getting his bib and merchandise for Sunday’s marathon. That pretty much was the highlight from this expo. I had seen a couple of things at the online shop prior to race day but they didn’t show the full range of sizes online. I tried to look for them at the expo but to be honest I was looking for something specific to the Challenge. I did go up and down the aisles and I did purchase a Philadelphia Marathon trucker hat but nothing else. I was really disappointed that they had no medals to see, nothing related to the Challenge of any sort and pretty much breezed through the rest of the expo and headed for home. I made my way home to set up my gear for the next day and the plan was to get an early night (or as best you can with two boys under 10 in the house). Race day arrived and I was up at 4am for the first of my two days of races. The Half Marathon started at 7:30am but I was my usual nervous self and got up early. The weekend forecast was dramatically different for both days. Saturday was supposed to start cool but warm up, but Sunday was supposed to be cold and windy with temperatures 20 degrees cooler than the day before. I made it downtown to my usual parking garage for race days (weekend rate $12 and only a couple of blocks away from the race staging area). As per the last few years (since the Boston Marathon bombing) there was a large security perimeter and security checkpoints around the various access points. I was early. It was a little chilly and I was dressed up in a jacket and light pants but I was still cold. I was more worried about the next day if I was this cold on the better weather day. Security seemed fairly quick and simple, probably because I was so early. I heard that later runners had a much different experience. People who had water bottles on race belts were not allowed to bring them into the area. People with gels and other types of fuel were also not allowed to bring things into the area. This was crazy. Runners train with specific fluids and fuels but the security or volunteers at the checkpoint were not letting people bring in their own stuff. Needless to say that when I looked at Facebook later in the day people were not very happy. This actually prompted the race directors team to send out an email on Saturday night before the Marathon with entry guidelines for Sunday. This should have been sent before the Half but this didn’t say anything about race fuels and said only that hydration packs or belts are allowed subject to screening. This wasn’t running as smooth as I had experienced in prior years. As I was so early I walked around for a bit, through Eakins Oval where the athletes village and charity tents were set up and then I walked over to the stairs of the Philadelphia Art Museum to see the Rocky statue. As dawn broke I made my way over to bag check and got myself all set and ready for the start of the race. I had been there for a while and hoped to get a couple of sips of water before I started the race, however, the pre-race water tent was not yet open. People were lining up as they started to open up and unpack the tent. Again, just another of those things that got to me since the expo. I hoped at least that the race would be run smoothly. The National Anthem was ‘played’ over the loudspeaker…yes, played. Not sung. Really? This is a pretty major race weekend. I was surprised. Soon enough the corral made its way to the start line and we were off. Every year that I have run this race (and I believe every year it was run prior to that too) the half and full races have been run together so I was very familiar with the course that the half marathoners used to run. This year the race organizers announced that there was a new course. Okay, it’s always good to make a change and I would at least not be running the same route back to back. The new course took us from the start down towards Independence Mall and wrapped us back around towards Logan Square. As is the case with Philadelphia, some people just walk out in front of you to cross the street because we are in their way. This was the case today. Luckily I was able to side step at the last moment or there would have been a pile on with a few runners. From Logan Square we ran up Martin Luther King Jr Boulevard (West River Drive) and into Fairmount Park. Around mile 7 we had the first of what would be a series of uphills. Seriously…mile 7 through 11 were pretty much constant up and down hills. Not rolling…steep grades. The half marathon course in prior years was pretty flat. There was the hill up through Drexel University and the hill up to Memorial Hall but they were nothing compared to the hills we had to run up today. Wow. As I wrote earlier, I was planning to run the whole way and not use my run/walk method. So far all was going well….until around mile 8 when I had to walk up the hill for about 60 seconds. It was getting quite warm at this point (ultimately the temperatures would be in the low 60s) and the hills just got to me. That was the only time I had to stop and walk. I continued on and we left the park on the west side of the river and crossed over a bridge to the east side of the park and another hill. What was noticeable now was that we hadn’t really seen any spectators since around mile 4 when we headed out on West River Drive. Spectators were one of the things that made this race great in prior years. Running through the city on the old course the crowds were awesome. So loud and jammed in on both sides of the street. Here we had…well, there was a kids’ soccer game going on but those spectators were for the peewee game not the runners. One thing I didn’t see, or maybe I just missed, was the energy gel station. There was supposed to be one around mile 8 or so. Nope, don’t recall it. Based upon what I read on Facebook after the race it wasn’t there. Considering that security had taken gels and other fuels off runners at the perimeter security checks that was not going to go over well. Once past mile 11 the terrain started going downhill. The temperatures had warmed up and I was looking at a pretty decent time. I was hoping to run the whole way (pretty much mission accomplished so far) and my goal was to get close to 2 hours. I had to save my legs for the next day. However, I felt good so decided to run harder the last mile and see if I could get myself a good time. As I rounded the end of Kelly Drive I was just under half a mile from the finish line. I pushed hard and crossed the finish line with a time of 1:54:57 (average pace 8:46). Wow. Very happy with that. I had some decent splits with my slowest mile being the one where I had to walk. I felt good. My legs felt fresh. Perhaps my weekend goal of getting a combined time of 6 hours was reachable. (2 hours for the half and 4 hours for the full was my goal). I wasn’t going for a PR but just a good performance. This was a great confidence booster going into tomorrow. Post race was set up differently than prior years. Probably because they had half the people per day as the races were split, the finish area was moved from the center of the Benjamin Franklin Parkway to a field on the left of the parkway. Post race refreshments were plentiful. Everyone was handed water and there was plenty of food (pretzels!!!!) for runners. No bags though this year like last year so it was pretty awkward to carry this as well as keep your mylar wrap on. Some folks turned their blankets into sacks. Handy folks. So as happy as I was with the race performance, I wasn’t thrilled with the course. Judging by the comments on Facebook not many people were thrilled. Their comments were the same as I had said above. There wasn’t enough time in the city. Plenty of time in the park but those places were not accessible for spectators so most of the run was pretty quiet for the miles in the park. The mess at security where people couldn’t bring in water packs and gels compounded by the lack of gels on the course. The lack of water at the start line. Surprising as this organization manages a much larger race (Broad Street has about 40,000 runners). I didn’t stick around as I wanted to get home and rest for tomorrow’s marathon. I headed back to my car, quickly (or as best I could) get out of the city and got home for a 20 minute ice bath and a hot shower. We had plans with friends that night so I took it easy and rested in the afternoon. I laid out my gear for the next day so I could get straight to bed when we got home. While we were out and about that evening the weather changed. The temperature dropped about 20 degrees and the wind picked up. Uh oh. Tomorrow was going to be quite a different experience. 4:00am rolled around (too quickly) and I got out of bed. I could hear the wind whipping around the house outside. This was going to be interesting. The temperatures were in the low 30s. Eek. I was hoping my outfit was going to be enough. I made it downtown and back to the same parking garage as the day before and headed over to the starting area. Security was much the same as the day before. The race organizers had sent out an email the night before saying what was and what wasn’t allowed through security. I assume they had shared the same email to security personnel at the checkpoints into the race area. It was cold. Windy and cold. I made my way over to where I would at least be away from the wind. So far I hadn’t been too impressed with the changes to the race but in one action the race organizers changed my mind. HEATED TENTS. Yes, they had opened up tents that were used for something else previously and connected up heat sources to them. I crowded into one of the tents with everyone else. It was tightly packed. I decided to stay in there as long as I could until I had to get in line to use the restroom and check my bags. I changed out of my warm gear and got my bib on. I waited until I thought was long enough before heading out. The lines for the restroom were not short and standing there in the cold wind was not the most fun I’ve had. Once I had done what I needed to do and checked my bag I put on my large trash liner. I was still shivering despite the layer. I got into the corral and waited for go time. This morning the National Anthem was actually sung by a real person…not pre-taped. In the corral. Almost GO time. So this was it. I was going to run my first marathon without run/walk intervals. My legs felt good despite having run a half marathon the day before. My goal was to get close to 4 hours. I was going to go for it and see how long I was going to last just running. As I approached the start line I almost missed the timing mat. I couldn’t see it ahead of me. Luckily I started my GPS watch just in time. More on that later. With that, I headed out on the familiar marathon course with a big smile. I just felt relaxed. The first few miles went well. I was glad that despite the weather and the wind, the crowds were out in full. The cheers of all the supporters as we headed through Old City and through Center City really helped keep up my spirits. I was keeping pace with most of the people around me. I had stalked out a few people who were similar pace. One person was wearing an ‘Ironman Finisher’ hat so I figured they knew how to pace themselves so I mainly tried to pace myself with them. The first big test of the marathon is the hill that runs up from Drexel University to the Philadelphia Zoo around mile 7 to 8. No walk breaks yet but I had to make a quick pit stop at the top of the hill (I’m getting old) but luckily this didn’t lose me too much time. From there the next test and really the only big test on the first half of the course is the run up hill to Memorial Hall. This is traditionally where I end up walking a little, but not today. I made it up without stopping. I knew it was flat once we reached the top so I could catch my breath as needed. Elevation profile for the marathon. The main hills are on the front half of the course. This was also the change to the course that was new this year. Rather than quickly round ourselves past the entrance to the Please Touch Museum and back onto the West River Drive we stayed up in the park and ran towards the Mann Music Center and rounded the back of the Please Touch Museum. As we passed the Mann Music Center I suddenly got a stomach cramp. Eek. No bathrooms in sight (I had passed them at the water station and didn’t think I needed another pit stop). My next couple of miles or so was a pretty anxious time. There was nowhere to ‘go’ and nowhere to ‘hide’ in an emergency. Double EEK!! All refreshed and feeling much better I set out to continue my run. As the course had been altered this year with the extra distance in the park, we reached the half marathon point while still running on the West River Drive rather than right in front of the Philadelphia Art Museum as in prior years. By the time we wrapped around the front of the Art Museum it was mile 14 and I arrived just as the leaders were making their way up the finish line. Here are my splits for the first half of the race. Despite two pit stops at mile 9 and 12, I still hit the half marathon point sub 2 hours. I was hoping that now I felt better, maybe getting close to 4 hours would be achievable. Only one way to find out, keep going. Also as we rounded the corner we were running headlong into the wind. The cold wind. And it was whipping up with sudden gusts every now and then. The second half of the marathon course is an out and back from the Art Museum to Manyunk and then back to the finish line on the Benjamin Franklin Parkway. With the added mileage the race had eliminated the small out and back at the Falls Bridge. I hated that in all the years I’ve run the race. Another way the race organizers endeared themselves to me today. The out and back on any course can be tough mentally. I had a few friends running so to distract myself during the run I kept looking for them. I didn’t actually see any friends until I was into the last few miles but it certainly took my mind off the race for a while. My favorite point in the race is the turnaround in Manyunk. I know I’m on the home stretch with just under 10K to go until the finish line. Here are my splits to the turnaround point. Slower but the wheels hadn’t fallen off like they had at this point at the Mohawk Hudson River Marathon the month previously. I still had something left in my legs and so I buckled down for the last 5 miles of the race. So having run to Manyunk into the wind and this being an out and back, you would think that I would be running with the wind at my back on the way to the finish line…not so much. Crazy. Well, at least the sun was out. Next thing I know I’m approaching the Art Museum and the finish line would be right ahead…or so I thought. If you recall I had almost missed the timing mat at the start but now I realized that because of the wind they had taken down the Start/Finish line banner. So as I approached the finish line I couldn’t actually see it. A sort of panic arose as I had started my final kick to the finish line but I couldn’t see it and I didn’t know how long I could sustain this pace after almost 26.2 miles. Finally I crossed the timing mat. I hit my watch and saw that I had finished under 4 hours. I couldn’t believe it. I had done it. In two days I ran sub 2 hours and sub 4 hours. I was elated. The post race area was the same as the previous day. Keeping my mylar wrap on in the wind was quite a challenge. The wind was still very strong and it was cold. Coupled with the rapid cool down post race these were not ideal conditions. I grabbed some food and asked a volunteer if there was anywhere I should go for the ‘Rocky Challenge’. As per the expo the volunteers didn’t really know what I was talking about. I had read and re-read the original press release when I got back from the expo and they did mention that there would be an extra medal. Finally I found a volunteer who motioned to a tent…not a specific tent but in a general direction. As with the Start/Finish line, all signage had been taken down so there was no way to tell which tent to look for. I saw someone else looking lost and I asked him if he was looking for the Challenge tent and he said he was so we both looked for it together. Finally we saw someone with a Challenge medal and they showed us which tent to go to. Because of the wind it was totally unmarked and was closed at all sides. We couldn’t find our way in. Luckily someone came out and we went inside. There were a couple of people checking details off a sheet and once they got my bib number they handed me my extra medal. All folded up. Not much fanfare and hidden from the main finish line area. I cannot imagine how many people missed this and didn’t pick up their extra medal. I quickly got my bag from bag check so I could get some warm clothes back on. I had also brought my medal from the prior day’s Half Marathon (I had never thought to do that at any of the runDisney races) so I could take a picture with all three medals. Once the photo was taken I got dressed as quickly as I could and headed back to the parking lot. It was too cold to stick around. I just wanted to get somewhere warm. I actually felt pretty good despite running 39.3 miles. I decided on the way back to the car to stop somewhere for coffee as I was shaking from the cold and just needed something warm before I got myself back into the car for the drive home. I found a small coffee shop on the way back. It was pretty crowded and full of runners and spectators but I didn’t want anything fancy, just hot black coffee so there was no long wait. I made it back to the car and put on my heated seats and drove home…wearing my medals of course. Looking back, I wasn’t thrilled with the weekend. The race organizers could do nothing about the weather but I was disappointed with the lack of response from the organizers on social media to any questions asked, the expo wasn’t too special and the fact that the Challenge seemed to be an after thought didn’t leave me with a good feeling. I really didn’t enjoy the new Half Marathon course but I guess moving to Saturday they had to avoid shutting down the whole city for two days. I just wasn’t a big fan of the course. What was good about the weekend was the new Full Marathon course. I loved the changes. I think the only thing that made the weekend memorable for me was the fact that I reached my race goals of running sub 2 hour and sub 4 hour races, especially following the Mohawk Hudson River Marathon disappointment in October. I was pretty much on a high for the next few days. Really proud that my run straight through attempt worked out. I got home and was excited to show the medals to my boys. It was 5 years since my first marathon in Philadelphia. This was my 5th Philadelphia Marathon and my 17th Marathon overall. Here I am from my 1st and 17th marathon. I guess (apart from a few more pounds I’m carrying this year) yellow is my color. I enjoyed my dessert that night. I’d earned it. Thanks for sticking with this one. It was a long write-up. Great recap! Congratulations on your accomplishment. I am new to running, only ever did a few 5Ks without really training (I was lured by the “Italian Stallion Challenge” extra medal for the Rocky Balboa Run–completing the 5K & 10 mile runs back to back). I’m considering the Philadelphia Marathon next year. We’ll see. The way I felt after my “half marathon”, I can’t imagine running a full the next day! But, with more regular running and better training…you never know. Again, congratulations!